Orbit Culture are a death metal band from Sweden, and asides from a few token similarities, I wouldn't describe their sound as falling in the Swedish Death Metal school. 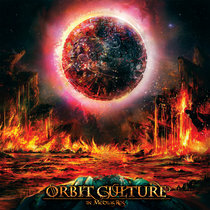 Instead Orbit Culture have cultivate their own brand of groovy and powerful death metal that blasts forward with a very clear and oftentimes poignant attack. Orbit Culture get what they want to do and how to do it, and the way their precision attacks blasts into your eardrums is not something to easily be forgotten. These guys understand what death metal is all about, crushing riffs that are still memorable and easy to latch on too. If nothing else, their new record In Media Res is an enjoyable listen. So if you need to get your fix of tight death metal that penetrates the soul and blasts your heart apart, then look no further. As these guys develop I'm sure they will be able to hone their tight sound into something even more unique, creating death metal that cures humanity of our fear of the dark.